Posted Jul 02, 2018 by Eds. 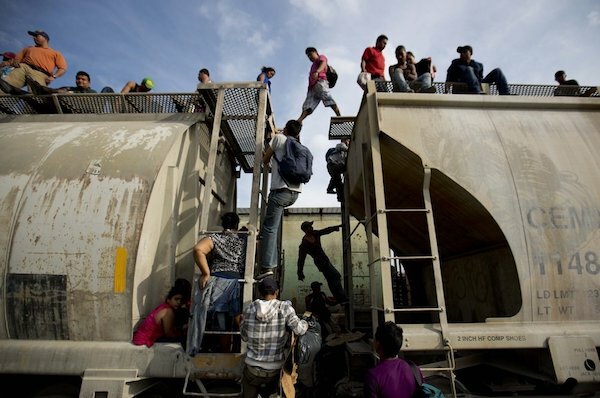 Why are thousands of Central Americans fleeing violence and economic devastation and flocking to the United States? Because of the American dream? Because the streets are paved in gold? If you’ve been following us over the past year, you know we keep it real. U.S. multi-national corporations’ and finance capital’s penetration of nations and control of peoples have wreaked the economic distortions, social violence, austerity and lack of democracy that push and pull people to leave their countries in search of security, peace and material survival. Yet these issues are presented as if they just descended from the heavens. What we are seeing is the inevitable and predictable consequences of the policies of successive U.S. administrations over the last three decades—all with the understanding that the neoliberal agenda would require a wall be built on the U.S.-Mexico border. NAFTA caused the first wave of migration, wherein millions of farmers were uprooted, thousands of women were forced into the slave conditions of the Maquiladoras and thousands of men sought sometimes dangerous work in the United States and Canada. Members of the Black Alliance for Peace (BAP) understand the link between the U.S.-backed coup in Honduras during the Obama administration and the subsequent violence and social instability that compelled so many to make the long trek from that embattled nation. And we don’t forget the irony that the one nation in Central America in which conditions didn’t force people to leave is Nicaragua, a state now engulfed in an intensifying social conflict that many suggest is being supported by elements of the U.S. state and its affiliated institutions. Migration is a class issue and migrants have human rights that must be protected. They don’t lose their human rights just because they cross a border and are “undocumented.” Unfortunately, U.S. officials’ understanding of what constitutes human rights is incredibly narrow. The United States doesn’t respect the human rights of migrants because they don’t even recognize the human rights of their own citizens. This was reflected in the recently released United Nations report on growing U.S. poverty. BAP National Organizer Ajamu Baraka writes that this narrow understanding of human rights ensures the United States will continue to violate human rights. Here is an analysis that makes the link between war, economic exploitation and migration. And while people are outraged—as they should be—that families were being busted up and children were being taken away and objectively imprisoned, it is important to note this classist and racist assault is not anything new for Black people. This leads BAP Coordinating Committee member and Black Agenda Report Senior Editor Margaret Kimberley to ask why the public has no sympathy for Black people.